The latest report from Job Openings and Labor Turnover Survey (JOLTS) shows that job openings in the United States are at a 15-year high. 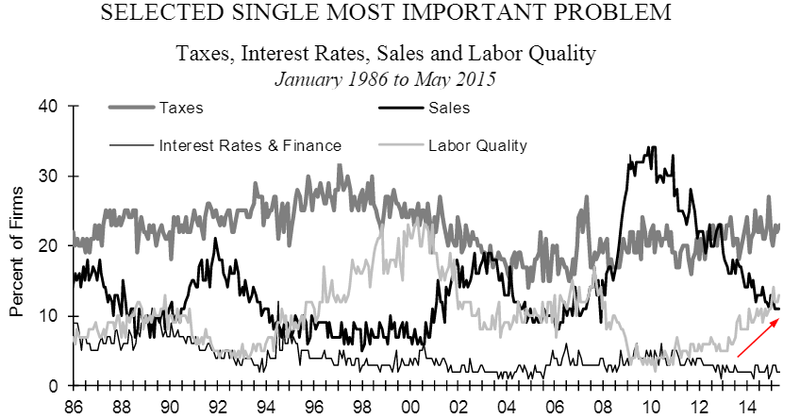 By the looks of the chart below, one could conclude that there is no slack in US labor markets. But as we know, that's not yet the case. Moreover, the NFIB small business survey shows US businesses increasingly struggling to find "quality labor" as the labor force skills gap (discussed here a year ago) becomes acute. 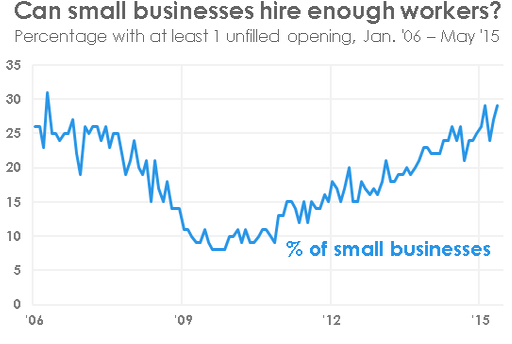 The percentage of small businesses with unfilled job openings is now above the pre-recession levels. To be sure, those trying to hire are getting dozens of applications. But the applicants lack the skills businesses are looking for. 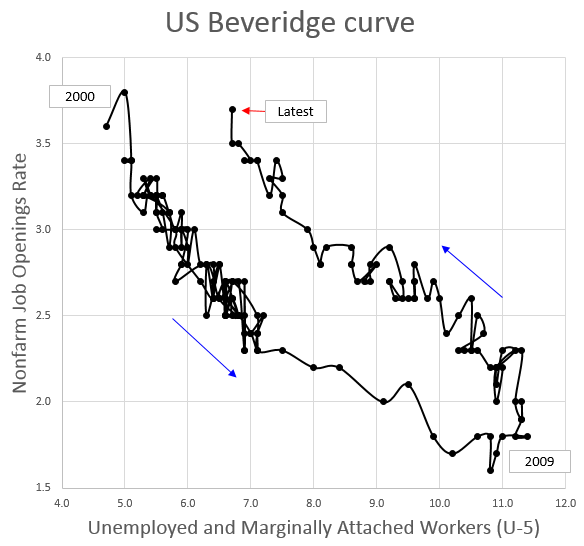 We can see more evidence of the skills mismatch in the latest US Beveridge curve that shows that the number of unemployed and "marginally attached" workers is much higher for the same number of job openings than prior to the recession. With all those discouraged workers who had left the labor force, shouldn't all these openings be filled quickly? They are not. That's because those without work are usually not the people businesses are looking for. Prior to the recession a great deal of the unskilled labor was absorbed in housing-related industries such as construction. Didn't finish college? No problem - there is a well-paying construction job waiting for you. But those jobs disappeared with the end of the credit bubble. 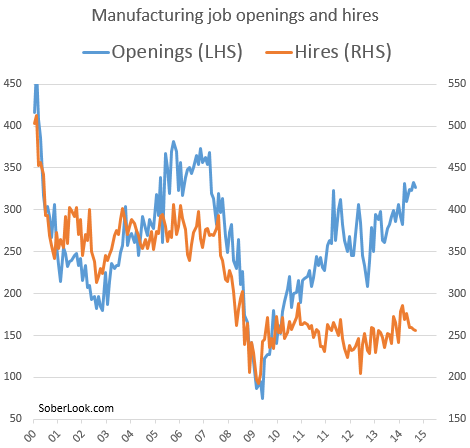 One area where the skills gap is especially pronounced is manufacturing. Modern manufacturing often utilizes specialized equipment and various forms of automation that require training and experience. However after years of offshoring, the US has gutted its manufacturing base, creating a large deficit of skilled manufacturing workers. The skills gap therefore is likely to persist for years to come, creating a material drag on economic growth.